After a long spell of wet weather, we are finally seeing some clear days in August, which I hope you are all enjoying. On site, it means that we are making good progress “getting out of the dirt”. Excavation is proceeding along Park Ave, and will be completed by the end of August. Site sheds will remain where they are on the south boundary, as there is just enough room in front of them to build the basement vehicle ramp. The north wing has now reached roof level on Park Rd, including the step down to the lower roof level along Seafield View Rd. Steel erection work is moving east towards Park Ave. 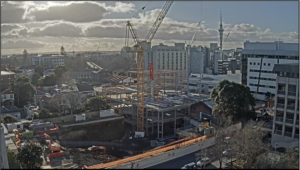 There will be a couple of more concrete slabs poured on upper levels at the west end, and then in mid-September that activity will also move eastwards. This will be followed by the commencement in October of façade cladding at the Park Rd /Seafield View Rd corner, with installation proceeding in both directions. The façade is unitised, meaning it is installed in large panels rather than sticks of aluminium and sheets of glass. Units will be lowered into place by crane and fixed to the structure from the inside. This means that there is very little scaffolding required, and progress should be relatively quick. Meanwhile, the erection of structural steel and concrete slabs will proceed on the south wing and central atrium, followed once again by the façade cladding. We expect the building to be fully closed in by the middle of 2019. Internal fitout and services will commence in the north wing in November 2018. Fitout will take a full year, and will be largely invisible to passersby. Of course, this look ahead is a brief summary. There are a few issues that may be of more immediate interest to some of you. I’m glad to say that our agreement with Council to work late on 2 August, if necessary, was not required. The weather was kinder, and adjustments to the concrete mix also helped with float finishing. We hope that this performance (by the weather and Hawkins) can be repeated, but work will also be moving away from Seafield View Rd in September, as described above. This means lower levels of noise for most of you, but we will continue to monitor noise and vibration at all stages of the structural build. The third monitoring activity is settlement. To date the perimeter pile capping beams at ground level are all within structural design tolerances – in other words, no unexpected levels of settlement have occurred on site. We also continue to survey some points off-site, notably the closest houses, with no negative impacts. We all look forward to seeing the building looking good in 2019, and the site activity moving inside. I’ll be in touch with another update before Christmas, and of course I can always be contacted by mobile phone or email.